When I was in elementary/middle school the beginning of the year brought many new things. New books, new friends (hmm… maybe not), new classes, and new stuff. While new clothes may have been superfluous the biggest waste I’d have to assign is to sneakers. Every year you’d walk into school with shiny new Air Jordans that hopefully your mom found at a reasonable price. But the majority of the time this had nothing to do with your old sneakers falling apart or your feet growing too fast. It was simply a status symbol. I recall even being jealous of the kids who could buy a new pair over winter break. Why would we need all those, fully functional shoes? This question has bothered me for years and is related to a new video by Annie Leonard. 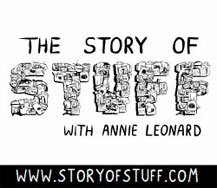 The Story of Stuff is a twenty minute video where Annie breaks down and points out the issues with our consumer culture. It was originally a slide show presentation (just like Al! only less controversial and less vice presidenty). This video will make you cry on Black Friday. My uncle mentioned this to me on Thanksgiving and this season is very fitting for a viewing. I’m glad that it’s getting recognition around the Internet. I couldn’t agree with you more. This bothers me every year around this time, the constant commercials for the holidays. Essentially they’re saying, ‘buy the most and best presents to show someone you care’. Isn’t spending time with family/friends more of the gift during the holidays?